If there are kids who cannot sleep even in the most splendid room without their favorite pillow, stuffed toy, or blanket, there are also adults who would rather stay at home than leave without their preferred utensils or charms. But in the event that you do not like drinking anything from any container that you have not inspected before, then by all means, get the travel cup from Kate Spade. Brand Visibility. Kate Spade’s name is very noticeable on the upper middle part of the promo gift. The user will just need to drink from it with the name facing forward, and those around him or her can see it unrestrictedly. Consumer Loyalty. The brand is respected in the industry because of the unwavering quality of their merchandise. 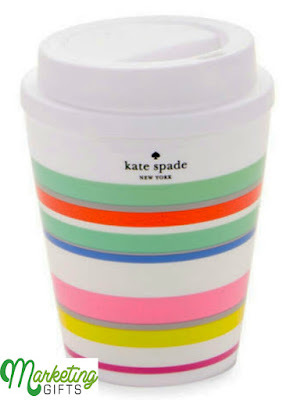 However, the customers’ loyalty to Kate Spade will achieve a nice boost due to the usefulness of the branded travel cup. Product Mindfulness. Seeing the gift with purchase can increase the curiosity of the people who are only slightly aware of the brand’s products. This is a genius way to market your brand, and it is all because of the visible name once again. Kindly assess the Marketing Gifts blog for extra promotional strategies.